OK, so here goes...my first blog. I don't have a clue if anyone will be interested in reading these, but I figure it can't hurt to get my thoughts down. Maybe I will learn something about myself through this process. At any rate, I am going to try to chronicle my adventures in creating art. It is sometimes frustrating and other times truly rewarding. I am blessed to be able to stay at home and "play". No matter how many times I might complain about the creative process driving me batty, painting is a gift and I don't want to sound like I take it for granted. I guess I should introduce myself to those who are reading this and don't know me. 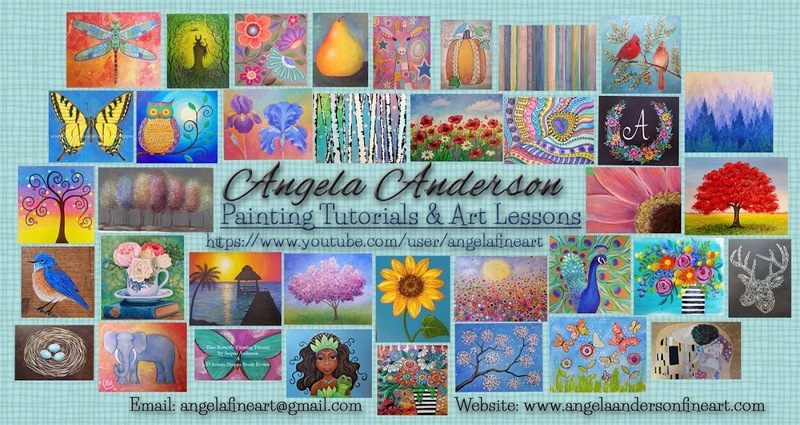 My name is Angela Anderson and I am an artist. I have been married for 20 years now to my high school sweetheart, and biggest supporter, Mark. He and I have 3 boys, the oldest of which will be graduating from high school this May (Yikes!). Our middle son will be driving soon (there goes our car insurance again!) and our youngest son is in first grade. I could do a whole blog on him alone! He is a little artist himself and a total rascal too. Our house is also home to two cats, a dog and a fish. In the summer we also host caterpillars and frogs. I will post photos sometime of our yearly butterfly metamorphosis. It is so much fun. "Scooter" our black, male schnoodle (schnauzer/poodle) puppy is the newest member of the family. Cashmere (our white, prissy, indoor kitty) is his girlfriend. They are so cute together. And Oliver, our outdoor (indoor only to eat & sleep) grey tabby tomcat barely tolerates the two of them. Cashmere uses the fish's tank as a drinking bowl. I have to keep my studio door closed or both of the cats will sneak in and drink my dirty paint water! Gross and probably not very healthy for them either! It's not like they don't have a full bowl in the kitchen! I mention the animals because I am SURE I will be talking about them disrupting things in the future. Our family are born-again Christians. We attend a non-denominational, charismatic church called Fellowship of Christians. 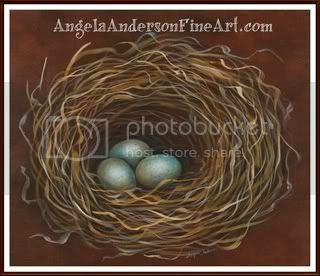 I help out with our women's bible study and fine art ministries there. So between church activities, kid's activities (soccer, football, track, band, etc. ), taking care of the house and pets, keeping up with friendships, and my career, things are never boring around our home! Through it all, Jesus is at the center of our lives, and bringing honor to him in everything I do is my goal.